Roger Tory Peterson commands respect. His legacy is not simply that he made the world a better place but that his works changed, and continue to change individual lives for the better. We asked you to share your thoughts about the Great Man in our Praiseworthy Peterson Field Guide Giveaway and you responded with just the kind of statements that would do him proud. Thanks to all who participated and congratulations to Joe, whose statement is at the top of this list, for winning a free copy of the Peterson Field Guide to Birds of North America courtesy of Houghton Mifflin. Roger Tory Peterson opened the window to the natural world for everyone with his first of its kind book that illustrated what we could see there and guided us to a way to explore it. Roger Tory Peterson, many years ago, was making a documentary on the Ring-billed Gull colony on the Leslie Street Spit in Toronto when, by happenstance, I bumped into him while birding and fortunately I had his wildflower guide with me (alas not the bird guide) which he was kind enough to autograph. Roger Tory Peterson and his life are the inspiration you need as a birder. Not giving up on a glum day – be back the very next day until you succeed! Roger Tory Peterson’s down-to-earth, accurate descriptions of bird behavior, songs and field marks introduced birding to me and were the reasons it became a lifelong hobby of mine. Roger Tory Peterson had the dedication to accomplish so much in his field, but also to inspire many others to love nature and explore it. I share his vision with my teenagers, who despite lack of peer sympathy, have an appreciation of nature that will stay with them throughout their lives. Roger Tory Peterson is the ideal that each and every naturalist,conservationist, birder or nature lover aspires to. Roger Tory Peterson, definitive birder, wrote the book that declared me as a birder when I was given it at the age of 17. Roger Tory Peterson with his field guide, revolutionized the way birding was done. Before RTP many so-called experts did not think it was possible to ID many birds in the field, with his field guide the average Joe could ID just about any bird in his yard and suddenly our knowledge of birds, their habits and ranges and the very way we look at birds was forever changed. Roger Tory Peterson was only 25 years old when he published his Field Guide to the Birds. 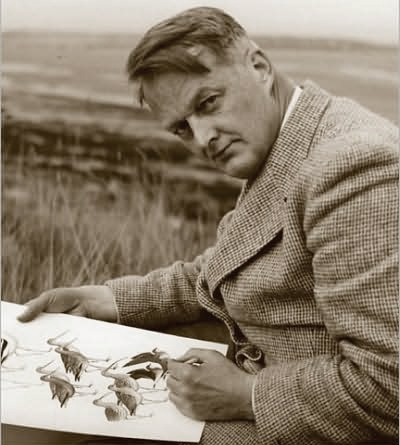 Although he was not the first to publish a field guide, his clear illustrations of key features revolutionized birding and influenced at least 3 generations of birding. With the new edition a fourth generation of birders can awaken to the wonders of birding. Roger Tony Peterson, I am ashamed to say, was someone I was totally ignorant of until just a few days ago, when I was reading archived entries in bird blogs/websites such as this. And then I remembered that the guide at my first ever bird walk last week used an old, worn copy of the Peterson’s guide to show us the difference between a Veery Thrush and a Wood Thrush, illustrations that my own guide didn’t contain. Roger Tory Peterson co-wrote Wild America with James Fisher, and edited or wrote many of the volumes in the Peterson Field Guide series on topics ranging from rocks and minerals to beetles to reptiles. Roger Tory Peterson was inspired to create his first field guide by a book called Two Little Savages by Ernest Thompson Seton. Roger Tory Peterson loved birds, just like me. Roger Tory Peterson started small and ended up moving mountains, first with his illustrations and then via his love of birds, boosted the entire conservation movement. To me, his name never fails to invoke the mental image of my worn Field Guide of Western Birds and how that launched my enduring love of wild birds. Roger Tory Peterson was a man of passionate devotion to his cause and his life’s work. He continues to be an inspiration to everyone that is touched by his field guides and his environmental legacy. Roger Tory Peterson once interrupted a very important person telling an anecdote about Winston Churchill by saying “I guess oystercatchers will eat any kind of mollusk.” How cool is that? Roger Tory Peterson was one of the few field guide artists to have painted the ivory-billed woodpecker from firsthand experience. While RTP revolutionized field guides, that was just a portion of his overall contribution. To learn more about King Penguin, I recommend reading Birdwatcher: The Life of Roger Tory Peterson by Elizabeth J. Rosenthal. For reflections on some of his myriad adventures in his own eloquent words, you’re likely to love All Things Reconsidered as much as I did. Thanks for the book! I couldn’t find my old copy of Peterson’s and I thought I must have put it in my storage unit. After digging through all the stuff I can’t fit in my NYC apartment, I still couldn’t find it. Since I don’t have to buy a new one I’ll add a few dollars to the jar I’m using to hold money for new optics, my “buy better binoculars bottle”. Where Are You Birding This Final Weekend of August 2014?